Add prices of your products or services on your ads for potential customers. Price Extensions are a pay-per-click extension that display your products or services, along with their corresponding prices, to searchers. 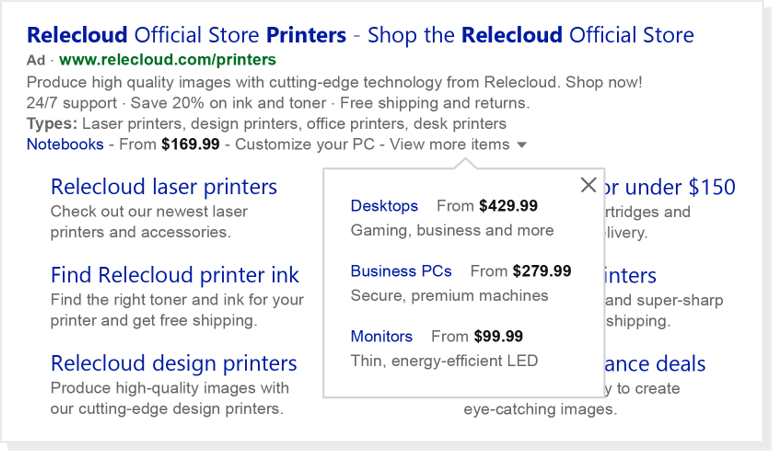 Price Extensions will only show on ads listed at the very top of the results page. This allows searchers to see to exactly what they’re looking for when they’re looking for it. This helps to increase your clicks and drive potential customers straight to your converting experiences. An account, campaign, or ad group can have up to 20 Price Extensions. Like any extension, Price Extensions are free to add to your ad and may not always show for every query. You only pay the standard ad headline cost-per-click for clicks you receive on Price Extensions. If you'd like to change the order of the items within a Price Extension, you can do so by selecting Edit Price Extensions under the Ad Extensions tab in All Campaigns. Here are the definitions for the different fields you need to fill in for your Price Extensions. Language The language you'll write your Price Extension text. The Price Qualifier (optional) and Unit (optional) will be automatically translated into this language. Type The category that best defines your Price Extension items and specifies the corresponding editorial checks which will be applied to them. Currency The currency symbol that will be displayed in the ad (for example, $ for USD). Header Similar to ad headline, the header introduces your products or services and appears as a clickable link that directs customers to your final URL. Your header can have up to 25 characters. Description Additional information about your products or services. Your description can have up to 25 characters. Please note, that you can include 3rd party retailers in your price extension by using the following text pattern: Product name. Product type. – 3rd party retailer name. Price. Price Qualifier (optional) Indicate prices for a given product or service, starting from a specific price and up to a maximum price. Please note, that you can choose any price value starting at zero. Negative values, however, are restricted. Unit (optional) Allows you to specify the service cost in terms of hour, day, week, etc. Final URL The landing page where customers will be taken after clicking your header. Prices on this page should accurately reflect the prices specified in the extension. Mobile final URL An optional landing page link that is only displayed on mobile devices. If no mobile final URL is provided, the default final URL will be used. Availability: All Bing markets, except China, Taiwan, and Hong Kong. Price Extensions can be created or edited at the account, campaign, or ad group level. To select the level you want to make the changes in, select Account, Campaign, or Ad group below the Ad Extensions tab. All extension details must adhere to our Price Extension policies. Each Price Extension must have a minimum of 3 items and a maximum of 8 items (Header, Description, Price qualifier, Price, Unit, Final URL, or Mobile final URL). How do I create a new Price Extension? If not already selected, click Price Extensions and select Account, Campaign, or Ad group. Click Add new Price Extension. Enter the Price Extension details and click Save. How do I associate an existing Price Extension to a campaign? If not already selected, click Price Extensions and select Campaign or Ad group. Select the price you want to add from the Available Price Extensions you want to add and click on the >> icon. How do I edit an existing Price Extension? Find the Price Extension you want to edit and then select the checkbox to its left. How do I delete an existing Price Extension? Find the Price Extension you want to delete and then select the checkbox to its left. How do I add a Price Extension to multiple campaigns or ad groups? If not already selected, click Price Extension. Select the available Price Extensions and click Save. How do I associate a Price Extension at the account level? If not already selected, click Price Extension and then Account. Select the Price Extension you want to add from the Available Price Extensions list and click the arrow to move it over to the Selected Price Extensions box.